The first Latin American actor to become a superstar, Ramon Novarro was for years one of Hollywood’s top actors. Born Ramón Samaniego to a prominent Mexican family, he arrived in America in 1916, a refugee from civil wars. By the mid-1920s, he had become one of MGM’s biggest box office attractions, starring in now-classic films, including The Student Prince, Mata Hari, and the original version of Ben-Hur. He shared the screen with the era’s top leading ladies, such as Greta Garbo, Myrna Loy, Joan Crawford, and Norma Shearer, and became Rudolph Valentino’s main rival in the “Latin Lover” category. Yet, despite his considerable professional accomplishments, Novarro’s enduring hold on fame stems from his tragic death—his bloodied corpse was found in his house on Halloween 1968 in what has become one of Hollywood’s most infamous scandals. Soares, André. 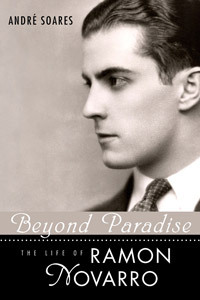 Beyond Paradise: The Life of Ramon Novarro. UP of Mississippi, 2010.